Dragon captured by the ISS’s CanadArm2. Via NASA TV. Running ahead of time, the International Space Station Expedition 33 crew successfully captured and installed the SpaceX Dragon capsule onto the Earth-facing port of the ISS’s Harmony module. Commander Suni Williams and astronaut Akihiko Hoshide captured the commercial spacecraft with the station’s CanadArm2 robotic arm at 6:56 a.m. EDT, and Dragon was officially berthed at 9:03 am EDT. 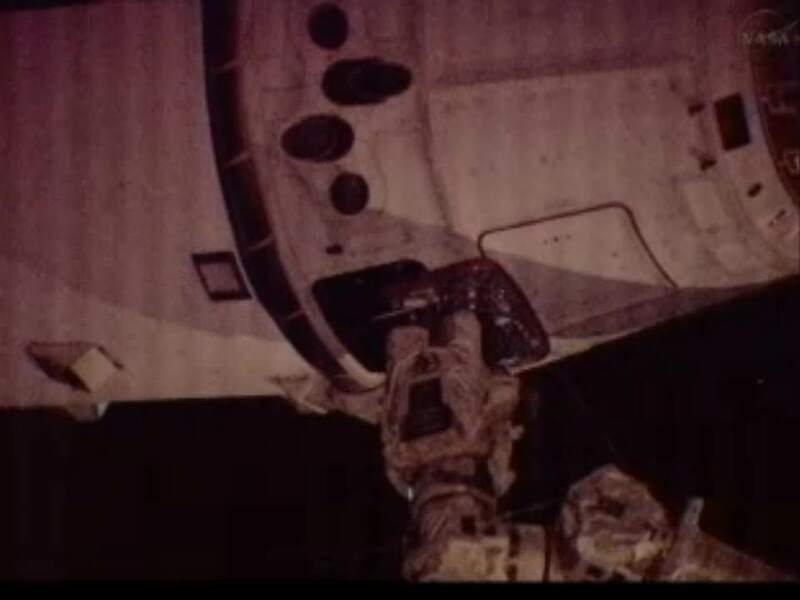 The hatch will be opened tomorrow was opened earlier than expected, today at 1:40 pm EDT and Dragon will be unloaded over the next several days. 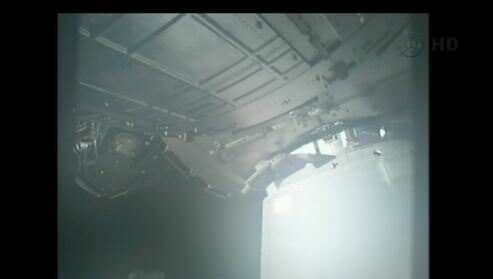 Later, they will be re-packing it full of items that will be coming back to Earth, as this spacecraft has the ability to return intact, instead of burning up in the atmosphere like the other resupply ships that come to the station. 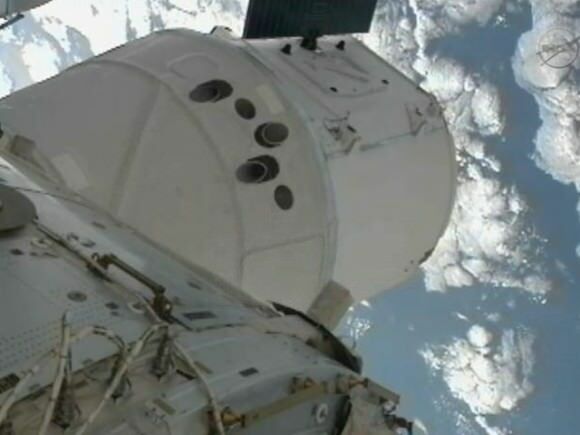 Dragon will spend 18 days attached to the ISS. Dragon approaches the ISS. Via NASA TV. Dragon is carrying nearly 400 kg (882 pounds) of supplies to the orbiting laboratory, including 117 kg (260 pounds) of crew supplies, 176 kg (390 pounds) of scientific research, 102 kg (225 pounds) of hardware and several kg/pounds of other supplies, such as food, water and Space Station parts. There are also 23 student experiments from the Student Spaceflight Experiments Program (SSEP) involving 7,420 pre-college students engaged in formal microgravity experiment design, according to SSEP director Dr. Jeff Goldstein. The special treat that Williams mentioned is on board a new freezer called GLACIER (General Laboratory Active Cryogenic ISS Experiment Refrigerator): Blue Bell ice cream, a brand that is a favorite of astronauts training at the Johnson Space Center. The freezer will hold experiments that need to be returned to Earth for further examination. Dragon will return a total of 758 kg (1,673 pounds), including 74 kg (163 pounds) of crew supplies, 392 kg (866 pounds) of scientific research, and 235 kg (518 pounds) of vehicle hardware and other hardware. Dragon in the “Ready To Latch” (RTL) position. Via NASA TV. 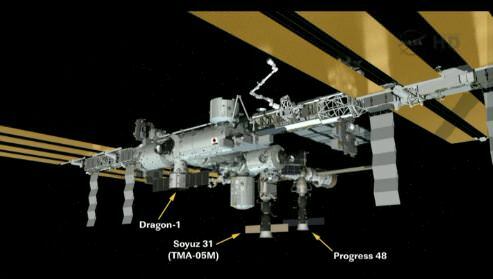 A NASA graphic showing the position of the Dragon capsule on the ISS. Via NASA TV. bravo again. here’s to fault tolerance and well written contingency code. Yeah but they need to work on that fault tolerance code since it could not compensate enough to put the satellite in the correct orbit. Excellent, now fingers crossed for a successful return journey and many, many more. Dreams of monthly flights with returnable rocket boosters… then weekly flights launching tools bound for the Moon! Come on, come on let’s go! 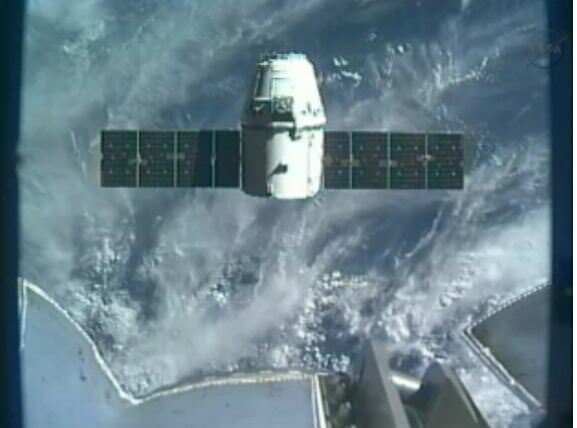 “Dragon Successfully Captured and Berthed at Space Station”… REALLY!? Does Daenerys Targaryen know about this?! Does anyone know who the people that keep down-voting UT articles comments recently are? That’s annoying and needs to be stopped.